It's the festive season, a time when holidaymakers will be flocking to Western Cape beaches for some relaxation. While this may be an opportunity to relax and have fun at the beach, remember that accidents can happen at any time. 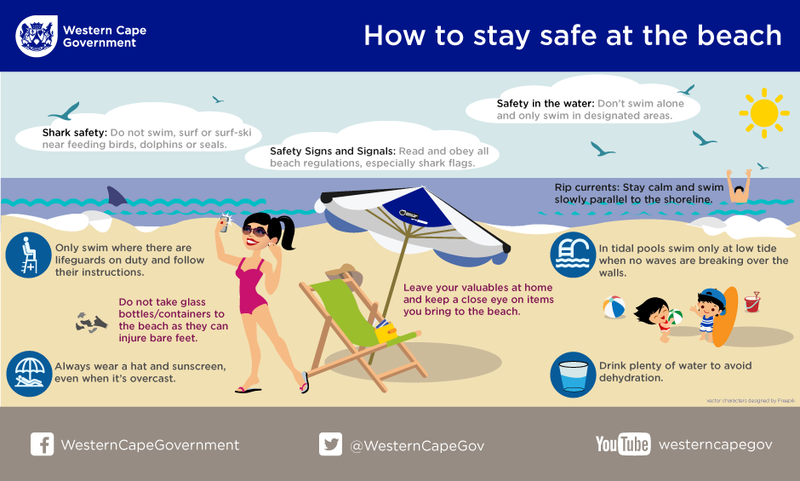 Have a look at these helpful safety tips to keep your family safe at the beach these holidays. Swim only where there are lifeguards on duty and where signs indicate that it's safe to swim. Make sure that lifeguards can see you when you are in the water. Don't swim when lifeguards are off duty. At the beach, always swim between the red and yellow flags. These indicate safe and supervised swimming areas. 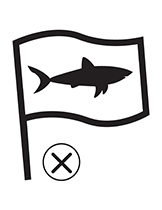 Areas outside these flags might conceal dangerous currents and tides. Only swim in areas where other people are present. Surfers and body-boarders shouldn’t surf in areas where bait and game fish are running, where seals are present, or seabirds are diving. If you find yourself in trouble, raise your arm to attract the lifeguards' attention and don’t panic. If you see someone in trouble in the sea, alert the lifeguards or find help. Don't put your own life in danger as well. Don't swim or drive motor boats while under the influence of alcohol. It dulls the senses, slows reaction times and can cause irresponsible behaviour. Alcohol isn’t allowed on Western Cape beaches. If you’re found with alcohol, you will be fined, and your alcohol confiscated. Know how to do cardiopulmonary resuscitation (CPR) or how to blow air into another person's lungs until help arrives. Don't dive from tidal pool walls, as this has been known to result in spinal injuries. Swim only at low tide when no waves are breaking over the walls. The pools provide a safer option to swim in than the oceans, as the currents are kept at bay. Don’t take out small or unstable boats far from shore in choppy water or stormy weather. Ensure that you protect your skin from too much exposure to the sun. Too much sun can cause sunstroke/heat stroke. Keep hydrated by drinking lots of fluids, excluding alcoholic drinks. Stay indoors during the hottest time of the day (11 am to 3 pm), and make use of sunscreen, hats and other attire. Children under the age of seven must be accompanied by an adult. Always obey the superintendent's instructions. Don’t swim under or near the diving boards. Only one person should be on a diving board at any given time. Don’t jump or dive to the side of the diving board. We're fortunate to have the Western Cape coastline as part of our home. There are also several international blue flag beaches located in our province, which we're extremely proud of. Here’s a list of the 2018/2019 South African Blue Flag beaches. Let's all pitch in to keep our beaches clean and clear of any litter, because litter can cause a safety hazard to humans and marine life, especially glass and plastic. Remember to leave it better than how you found it - if you see it, pick it up, and be an example to other beachgoers. Water through a surf zone that is a different colour than the surrounding water. A break in the incoming pattern of waves. Seaweed or debris moving out through the surf zone. Isolated turbulent and choppy water in the surf zone. If you’re caught in a rip current the main thing to do is to stay calm and relax. Swim slowly and conservatively, parallel to the shoreline or relax and let it carry you out past the breakers until it slacks. If you can tread water or float, you’ll be safe until you can escape the flow and head back to the beach. When you head back in, do so at an angle to the shoreline. Again, maintain a slow and relaxed pace until you reach the shore or assistance arrives. Always make sure you are swimming where lifeguards are on duty. Remain calm and raise your arm to attract the lifeguards' attention. Don’t swim, surf or surf-ski when birds, dolphins or seals are feeding nearby. Don’t swim in deep water beyond the breakers. Don’t swim if you’re bleeding. Don’t swim near river mouths. Don’t swim, surf or surf-ski near areas where trek-netting, fishing or spearfishing is taking place. If a shark has recently been sighted in an area where no shark spotters are present, consider using another beach for the day. First-time visitors to beach areas should ask the local law enforcement officials, lifeguards or locals about the area. For kayaking or surf-skiing far out to sea, consider paddling in groups and staying close together (in a diamond formation). Consider using a personal shark shield when you go surfing or kayaking. Pay attention to any shark signage on beaches. 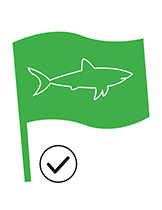 A green flag means that the spotting conditions are good and no sharks have been seen. 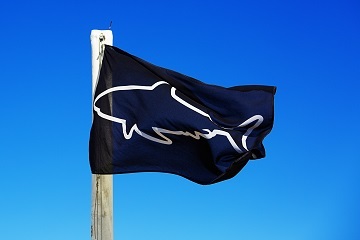 A black flag means that the spotting conditions are poor, but no sharks have been seen. 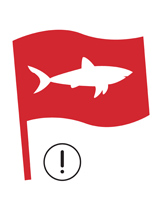 A red flag indicates a general shark alert, and is raised when a shark has been observed in the area in the past two hours, when an increased presence of sharks has been observed or when conditions conducive to increased shark activity exist, example; fish activity or whale strandings. This flag will be lowered only when the alert is no longer necessary and will be flown in conjunction with one of the other spotting flags. 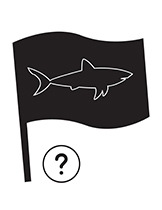 A white flag with a black shark diagram means that a shark is currently near the beach, and beach users must get out of the water. A siren will sound and the white flag will be raised. Make sure you keep emergency numbers memorised or saved for urgent assistance. 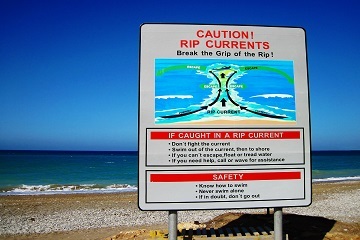 What to do if you're caught in a rip current?